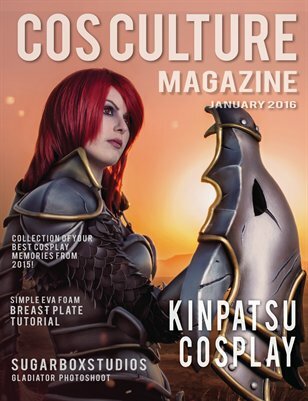 Cos Culture Magazine is your leading #cospositive voice for the cosplay community. The January 2016 issue features: - An interview with Kinpatsu Cosplay, including a step-by-step tutorial on how to build a simple EVA foam breastplate. - Photography feature and interview with SugarBoxStudios and his awesome Gladiator-themed photoshoot. - Your favourite cosplay memories from 2015. As always, this publication features absolutely no advertising. Please note: Issues printed through Magcloud vary slightly in size and style to the twice-yearly printed issues available directly through publisher.